Many patients undergoing TKA have both knee and ankle pathology, and it seems likely that some compensatory changes occur at each joint in response to deformity at the other. However, it is not fully understood how the foot and ankle compensate for a given varus or valgus deformity of the knee. (1) What is the compensatory hindfoot alignment in patients with end-stage osteoarthritis who undergo total knee arthroplasty (TKA)? (2) Where in the hindfoot does the compensation occur? 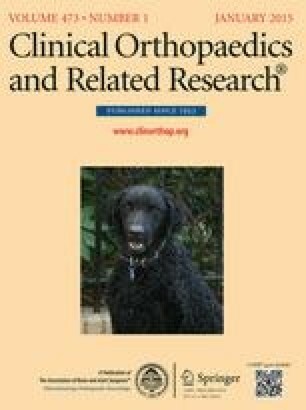 Between January 1, 2005, and December 31, 2009, one surgeon (JJC) obtained full-length radiographs on all patients undergoing primary TKA (N = 518) as part of routine practice; patients were analyzed for the current study and after meeting inclusion criteria, a total of 401 knees in 324 patients were reviewed for this analysis. Preoperative standing long-leg AP radiographs and Saltzman hindfoot views were analyzed for the following measurements: mechanical axis angle, Saltzman hindfoot alignment and angle, anatomic lateral distal tibial angle, and the ankle line convergence angle. Statistical analysis included two-tailed Pearson correlations and linear regression models. Intraobserver and interobserver intraclass coefficients for the measurements considered were evaluated and all were excellent (in excess of 0.8). As the mechanical axis angle becomes either more varus or valgus, the hindfoot will subsequently orient in more valgus or varus position, respectively. For every degree increase in the valgus mechanical axis angle, the hindfoot shifts into varus by −0.43° (95% confidence interval [CI], −0.76° to −0.1°; r = −0.302, p = 0.0012). For every degree increase in the varus mechanical axis angle, the hindfoot shifts into valgus by −0.49° (95% CI, −0.67° to −0.31°; r = −0.347, p < 0.0001). In addition, the subtalar joint had a strong positive correlation (r = 0.848, r2 = 0.72, p < 0.0001) with the Saltzman hindfoot angle, whereas the anatomic lateral distal tibial angle (r = 0.450, r2 = 0.20, p < 0.0001) and the ankle line convergence angle (r = 0.319, r2 = 0.10, p < 0.0001) had a moderate positive correlation. The coefficient of determination (r2) shows that 72% of the variance in the overall hindfoot angle can be explained by changes in the subtalar joint orientation. These findings have implications for treating patients with both knee and foot/ankle problems. For example, a patient with varus arthritis of the knee should be examined for fixed hindfoot valgus deformity. The concern is that patients undergoing TKA, who also present with a stiff subtalar joint, may have exacerbated, post-TKA foot/ankle pain or disability or malalignment of the lower extremity mechanical axis as a result of the inability of the subtalar joint to reorient itself after knee realignment. A prospective study is underway to confirm this speculation. Level III, therapeutic study. See Guidelines for Authors for a complete description of levels of evidence. One of the authors certifies that he (AA) has or may receive payments or benefits, during the study period an amount USD 100,000 to USD 1,000,000 from Arthrex (Naples, FL, USA), an amount less than USD 10,000 from Arthrosurface (Franklin, MA, USA), and an amount USD 100,000 to USD 1,000,000 from MTP Solutions (Logan, UT, USA). One of the authors certifies that he (JJC) has or may receive payments or benefits, during the study period an amount more than USD 1,000,001 from DePuy (Warsaw, IN, USA) and an amount less than USD 10,000 from Lippincott Williams & Wilkins (Riverwoods, IL, USA). Clinical Orthopaedics and Related Research ® neither advocates nor endorses the use of any treatment, drug, or device. Readers are encouraged to always seek additional information, including FDA-approval status, of any drug or device prior to clinical use. This work was performed at the University of Iowa Hospitals and Clinics, Iowa City, IA, USA. We thank Yubo Gao PhD, for assistance with statistical analysis.